This is the fifteenth in this series of 26 posts, one for each letter of the alphabet, that I am writing during the Blogging from A to Z Challenge, April 2016. You can find all the posts, as they are published throughout the month, by following the A-to-Z April 2016 tag. O is for O Sensei. At the front of every Aikido dojo is a photo – usually a formal portrait – of a man, usually old, sometimes smiling, sometimes stern. This is Morihei Ueshiba, or O Sensei, the founder of Aikido. 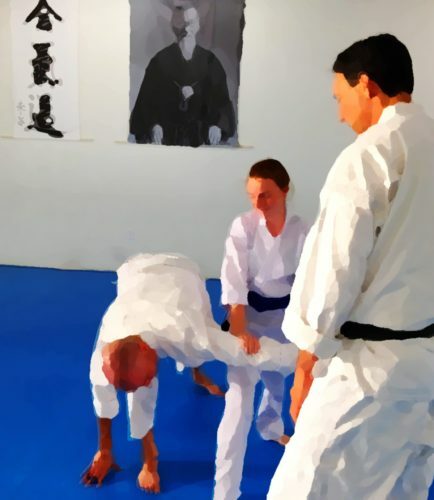 We learned some basic facts about him when we discussed History – How Aikido Came Into Being. I’m not going to repeat those here. There are many books by and about him. There are some old films, and many photos. There are articles and interviews. Most – at least those few that I’ve read, seen, or heard so far – focus on his philosophy, teachings, and accomplishments. Essentially his professional side. But I often wonder what kind of person he was. I’ve seen a few glimpses in the sources I mentioned, and I’m always looking for more. O Sensei died 7 years after I was born. This leaves me with the sense of having only just missed seeing a dear friend, discovering later that our paths had nearly crossed. Although I never had the honor of meeting Ueshiba Sensei I feel a kind of kinship with him. Like a great-grandfather I’d never met, but came to know through stories told at family gatherings, photo albums, and old letters. I’ve been taught, hands-on, by teachers who learned from his touch – knowledge passed from body to body to body. When I tested for sho-dan, the first black belt rank, instead of an essay (as we usually do in our dojo) I wrote a letter to O Sensei. I think I would have liked him. I hope he might have liked me. I imagine he must have been generous and kind, industrious, and probably demanding. A selfish, mean-spirited, lazy, or apathetic person could not have done so much for others. By all accounts I’ve read so far, Morihei and and his wife, Hatsu, were dear friends. But was he cranky until he’d had his morning tea? After a long day of teaching, did he come home and lament privately that the students all seemed to have forgotten all he’d taught them just the previous day? Did they ever have a cat? 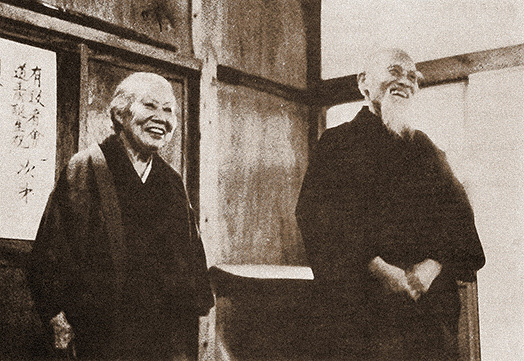 Here Gaku Homma Sensei of Nippon Kan provides a fascinating look at O Sensei’s daily habits in A Day in the Life of the Founder Morihei Ueshiba, April 1968. Toward the end of the article is a sample menu of what the founder typically ate. Homma Sensei has several more such posts on his site, and I encourage you to explore them. During several parts of his life Ueshiba was a farmer. When I watch my own teacher, Dave Goldberg Sensei, he reminds me of a farmer. He plants a seed and waits patiently while it grows in its own time. He waters here, prunes there, and watches again, knowing you can’t rush growth. If you have been reading my blog for a long time you may recall that I took up Aikido to help with my horsemanship. The two pursuits dovetail so well. I was delighted to learn in 2012 that O Sensei had raised horses during his time in Hokkaikdo. How much he was personally involved with them, I don’t know. Did he ride? Did he use them farming? Or logging? He apparently also befriended wild animals, including bears. I’ve not found much information about these things, but it doesn’t surprise me. I’d love to learn more. O Sensei with his clothes off? Here is a brief radio interview with O Sensei when he was about 85 or 86. Or 80. It reveals a warm sense of humor. He talks candidly about being old, and how aging changed him. Every so often one is asked “If you could have dinner with anyone, past or present, who would you choose.” I would love to have the opportunity to talk with O Sensei. He had such a powerful, positive impact on so many lives, deliberately, through Aikido. What a pleasure it would be to spend a few hours getting to know him. For better or worse, here is the video. My shodan exam, on 13 December, 2014. I had the great opportunity to talk with Frank Bloksberg Sensei on Thursday, May 25, 2013. We had a really good time talking about my experiences as a newbie at the Retreat in 2011, and about what to expect at the upcoming Retreat the last week of June 2013. I really enjoyed chatting with Bloksberg Sensei, and we covered a lot of interesting details and some fun stories. Give it a listen – almost an hour long. Enjoy! A bit of silliness (but also a fun way to get a feel for actually hitting/cutting with weapons). Full text here. Video here. Here’s a short video by Mark De Souza (who I finally got to meet here!) that’s a very representative bit of the 3-day seminar with Dan Messisco Sensei at Two Rivers Budo in Sacramento, California. When I signed up, I had no idea who Messisco Sensei was, or what his seminar might be like. I really enjoyed it, especially because the pace was very slow. By that I mean there was a lot of vigorous training, but plenty of time to absorb the information presented. Some seminars are very interesting, but there’s so much thrown at you that it’s hard to retain any of it. Here I felt I actually was able to experience, and experiment with, what we were working on, not just get a quick look and move on. I’ll definitely be looking for more opportunities to train with Dan Messisco Sensei. This was the first seminar held at Geoff Yudien and Adam Fong’s new dojo. Three of us from Aikido of San Diego drove up, picking up a fourth friend along the way. We had a great time, start to finish. A classic road trip, with great truck stop food, long conversations, and amazing scenery. The whole Central Valley was in bloom (almonds, mostly). If you are planning to visit this dojo we would all highly recommend the Residence Inn, Cal Expo as a place to stay. They have big suites that are perfect for 3-5 people. Also, be sure to eat at Thai Chef’s House, near the dojo, and the Mongolian BBQ across from the Inn. I’ll be going back to Two Rivers Budo when George Ledyard Sensei visits in September. Already looking forward to it. This link goes to the HD version – probably best watched full-screen. If you have a slower connection, change to one of the lower-res versions. Feedback (which I know will be constructive, even if it’s critical!) is welcome. I’m pretty happy with how I did, but of course can see lots of things to work on for next time. This video, from MocaEnBoca.tv, in Spain (with English subtitles), is one of the best I’ve seen for introducing Aikido to friends. Enjoy. I happened to stumble onto this video via iTunes today. It’s part of a video podcast series on culture in Spain. It simply and elegantly answers “what is Aikido?” in terms anyone (non-practitioners) can easily understand. Nicely done. I recommend Full Screen mode (click the little monitor icon). Congratulations to everyone who tested today!